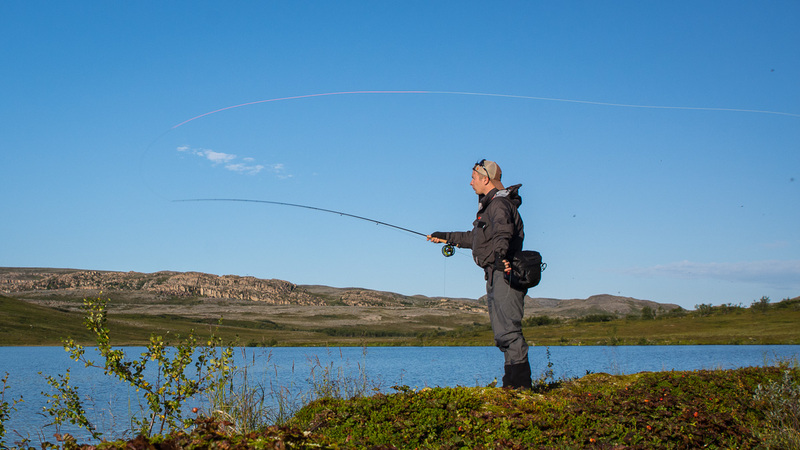 Finnmark County is the most northerly county in Norway and offers world-class fishing for grayling, trout and char. It is a fishing paradise like no other and a place that you certainly want to go back to. The lakes are many, the distance long and the terrain is challenging. Large altitude differences and changing weather conditions makes the hike to a challenge even for the most persistence and physically fit fisherman. On the other hand, you have plenty of possibilities to find your dream water. With enough patience, careful planning and good endurance both physically and mentally, you can go far out in the mountain and explore large areas where very few people set foot. The first trip was scheduled for 4-5 days and included a couple of really interesting fishing waters that we had heard many stories about. Unfortunately this trip turned out different from the dream trip we wanted it to be. After 7.46 miles in to our hike on the first day we met ice-covered lakes at 350m altitude. We were well aware that this year’s snow was melting at an extremely slow rate, but we didn´t expect that snow and ice would still remain on the fishing waters in the second week of July. The few places where water could be seen when we passed at a slightly lower height gave no impressive results. Furthermore insect life was still very passive after the winter and we saw just a few active fishes far out in the lake, impossible to catch. The hike was more demanding than we thought, also with 30-35kg of extra weight on the back and a couple of days with bad fishing, the energy disappears quickly. But shame on the one who gives up! The weather got better, the insect life got more active and the northern summer sometimes offered really entertaining fishing, something I’ll never forget. When I sit and look through the window during autumn and winter and hear the heavy rain hit the window frame, I wish I could turn back the time to the magic moment when the fish takes the fly and the fight is on. The memories are played as an endless movie as you scrolling through the pictures of the past season. You should always have an extra rod if the unthinkable happens… In most cases I used my Fario CRS #5 9″ with a Presentation EVOLVE #5, although my RSI #7 9″ with the Bullet EVOLVE #7 line also came to use when the wind increased during the afternoons. As a third rod I had the Fario Classic #4 9″ with a Presentation EVOLVE #5 line, this rod was used only when the wind and weather conditions was perfect. Five valuable tips for mountain hiking. 1. Something that’s obvious is that the shoes are an important detail when hiking, but the fact is that many forget about the socks. Get good socks for hiking, a pair that are thinner and a pair that are little thicker. Why? Because the friction occurs in the layer between the socks instead occurring between the skin and sock, a main reason to why people get chafed feet. Two sets are required for longer hikes and you should change socks at each break so you always have a set of dry socks to wear while you hang the other socks on your backpack so they can dry. 2. Keep the height as you walk. This may be something that’s obvious for the experienced hikers but a mistake many beginners do. You may be attracted to follow the slope of the field especially when you get tired, although in nine cases of ten it takes both longer time and becomes much more difficult in the end. I’d rather choose a little longer route with less altitude differences than the other way round. 3. Do a careful planning and check the weather conditions before you start hiking. Which route looks best in advance? How many nights do you expect to be hiking? How will the weather turn out to be? Prepare everything and tell somebody your plans and route and when you expect to be back. 4. I recommend you to try a pair of hiking poles, it facilitates walking and relieves knees and joints. Furthermore you get much better balance, especially with a heavy backpack on your back. 5. Something I really want to recommend is to dehydrate your own food to bring with you on the trip! The dehydrated food that you can buy in the stores is an easy way out but varies in quality and sometimes is very expensive. You can dehydrate your food in the oven with good results, thought a dehydrator will be smoother and faster to deal with. Before our trip we dehydrated minced meat with tomato sauce, chili con carne, chicken curry and beef which we then vacuum sealed in batches for two people. We varied between pasta and rice as side dishes, excellent energy sources in relation to the low pack weight. All dishes tasted over the expectation and was much better than the dehydrated meals you can buy in the store. GALLERY WITH FULL SET OF IMAGES BELOW!